As warm weather quickly approaches, the longer days and evenings beckon all of us to enjoy the beautiful outdoors. If you are like a majority of homeowners, patio and deck investments provide ways to entertain in the natural environment with friends and family and to partake in a warm cup of coffee in the early morning. 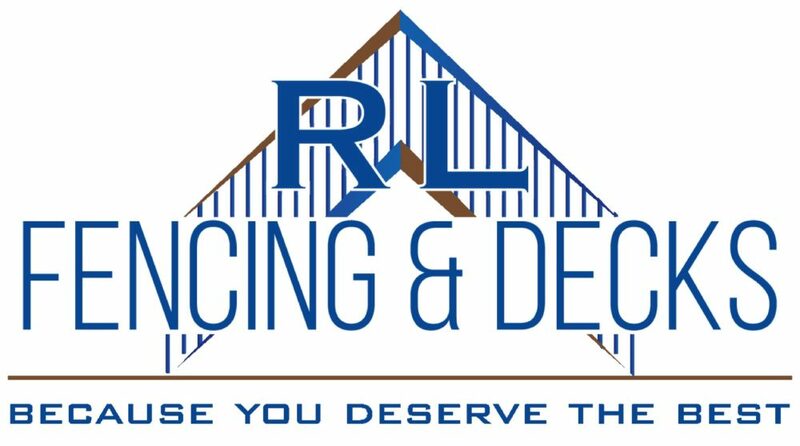 RL Fencing and Decks is not only the leading fence builder in the area, we would also like to take a moment to relay our adoration for aesthetics. We take pride in fabricating the deck of your dreams. However, it is also our desire to share decorating trends for the 2017 summer. We believe these ideas will continue to enhance your summer experience and provide you with an assortment of possibilities that can be tailored to the desires and needs of you and your household. In preparation of decorating your newly built deck or existing deck, consider some of the popular trends we discovered for 2017. 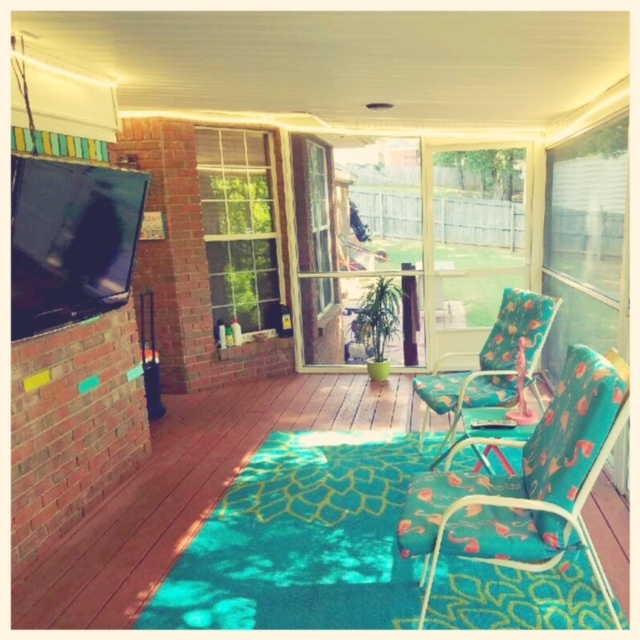 Continue reading to find pictures below of how our clientele recently decorated their finished deck and screened in room addition. As of lately, outdoor furniture has recently evolved from the distinctive metal, plastic and wicker we are familiar to seeing. Manufacturers are creating pieces to accommodate the continually increasing desires of the consumer. Outdoor furniture has begun to resemble interior living spaces with fabrics and materials that retain the durability to withstand the outdoor elements. For example, fireplaces and outdoor kitchens are now replacing the common fire pit and grill. In keeping suit, decks and patio fabrics now offer more modern and contemporary designs that facilitate the comfort of the interior atmosphere while enhancing the beauty and scenery provided by nature. In the past, a simple table and chairs was sufficient décor to entertain family and friends throughout the summer and into the fall. However, recently homeowners are expanding their creativity and designing outdoor living spaces with vibrant inviting themes and hues. Neutral backgrounds provide gorgeous backdrops for bold and bright colors that allow you to make a statement about yourself and your home. Accent pieces such as throw blankets, pillows and wall hangings are additional items that complete the vision of your outdoor living space. If bold pieces and vibrant colors are not your first choice, don’t fret or become distracted while searching for pieces that are a more suitable match for yourself and your home. Conventional designs will always remain a staple item. Classic pieces never fall away; however, they may be slightly removed from the forefront and will require you to broaden your search. A few examples of classic pieces are wrought iron chairs and tables. In particular, this style of furniture works exquisitely positioned in a garden or a landscaped orchard. 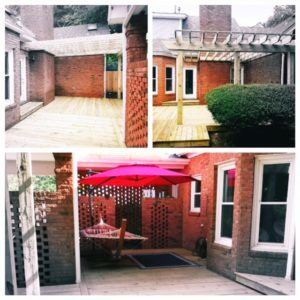 You also have the possibility to extend your deck or patio into the garden area. Walkways and entrances can be created by installing pavers that can be specifically used to design paths and sitting areas. If you prefer a more nostalgic atmosphere, take the opportunity to explore and reinvigorate past trends for the current year. Retro designs are becoming very popular and have given outdated trends new life. Many homeowners are electing back rattan and modern wicker pieces. 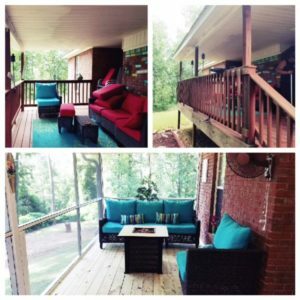 If you prefer to have a deck or patio that blends in with the natural surroundings; consider purchasing furniture that is made with wood, woven by hand to mimic the outdoors or even refurbished pieces similar to the ones that adorned your grandmother’s deck or patio. If you enjoy the distressed appearance of some pieces, it is nice to know that over time, many materials will develop a worn an aesthetically pleasing distressed expression. A popular and calming color that sets the stage for a serene summer is blue. Conceivably, it’s because blue is the color of a warm summer sky or the shade of the ocean or calming lake. Blue is quite popular this year and manufacturers are incorporating the color into their patio and deck decor. Mosaic decor incorporates bright designs and colors that have continued to be a favorite in exterior design. Designers are creating accent pieces such as unique table tops and ceramic and stone decor that convey an eclectic vision to your guests and family. It is most important to decorate your space that reflects your personal style and flare. If you are building a new screened in porch or deck and patio, take a moment to see what’s currently being offered in terms of new ideas and furnishings to welcome in the warm extended days of summer. Draw a diagram of the layout you would like to utilize with your patio furniture. Try to think about where the sun is throughout the day, and make certain seating options are available for both the sunny and shady areas. Consider using a paste wax on aluminum patio furniture at least twice each year to prevent weather damage to the surface. Lubricants work well when applied to moving parts to prevent rust and corrosion when not in use. If wicker or rattan furniture is the way you elect to decorate your patio, maintenance is required. The sun is a major factor and will dry out the wood and give the furniture a dull appearance. Wicker is also prone to retain mold and mildew which are factors to keep in mind when deciding on furniture. Wrought iron will also require upkeep to avoid damage brought on by environmental elements, such as sun and water. If you need to remove small patches of rust or scratches, it is recommended that you apply a light abrasive cleaner and scrape. After removal of access rust, coat the surface with a moisture resistant spray to seal. We are excited to share recent pictures provided by our customers in the Tri-County area. The visuals provide examples of how they incorporated these trends into their finished deck and screened in room addition. A fire pit now replaces an ottoman while blue cushions and small decorative pillows add small detail. 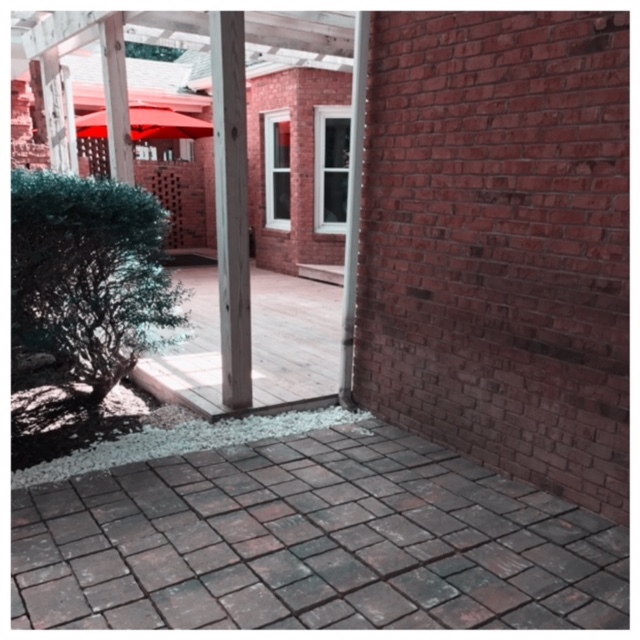 Pavers were later added by our customer to extend the outdoor space, along with decorative white gravel. A TV is hung to provide entertainment. A new area rug and chairs tie the living space together. A hammock, rug and umbrella provide shade and a peaceful place to relax. This entry was posted in Tips by Rocky. Bookmark the permalink.